STM is the acronym for “Strut and Tie Models” or “Strut and Tie Methods“. It is a design method of reinforced concrete structures by idealizing structural components as truss models which are composed of axially loaded members, including compression bearing members (strut) and tension bearing members (tie). The word “B region” is short for “Bernoulli region” or “Beam region“. According to Bernoulli hypothesis (Plane sections remain plane after bending…), the strains in concrete structures follow a linear distribution. 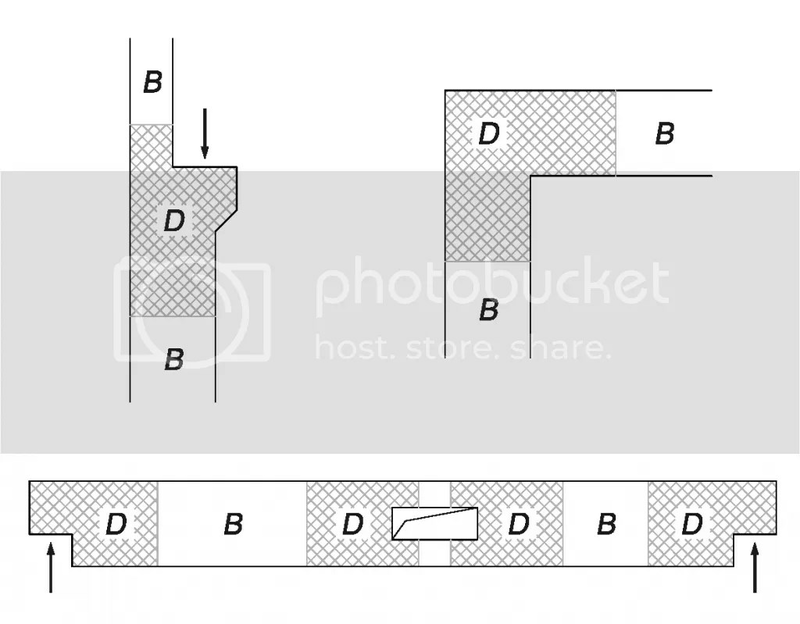 This is the theoretical basis for flexural design of concrete components. Those regions which follow Bernoulli hypotheses belong to B regions. They could be designed by simple calculations. Corbel is an example which does not follow the Bernoulli hypotheses. It is discontinued in geometry. Or we can say the stress and strain in corbel is disturbed. D region means “discontinued region” or “disturbed region“, such as corbel. These D regions do not follow Bernoulli hypothesis. Thus, they could not be designed or analyzed by simple calculations. The solution is either empirical approximation or very complicated computations such as FEA methods. Besides corbels, there are many other types of D regions, such as deep beams, pile caps, beams with opening holes, and beam-column joints. 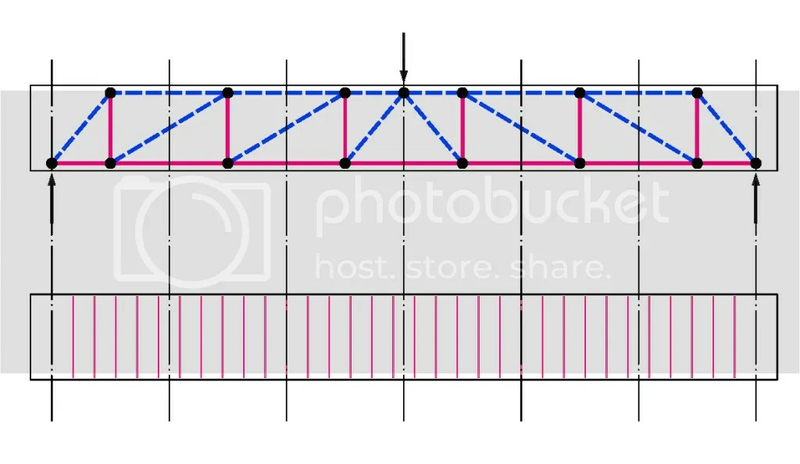 Take the design of pile caps as an example. In many cases, pile caps are designed by beam theory. They are assumed to fail in flexure, which is a ductile break and has warning cracks. However, according to several research works, the failure modes of most of them are brittle shear failures. 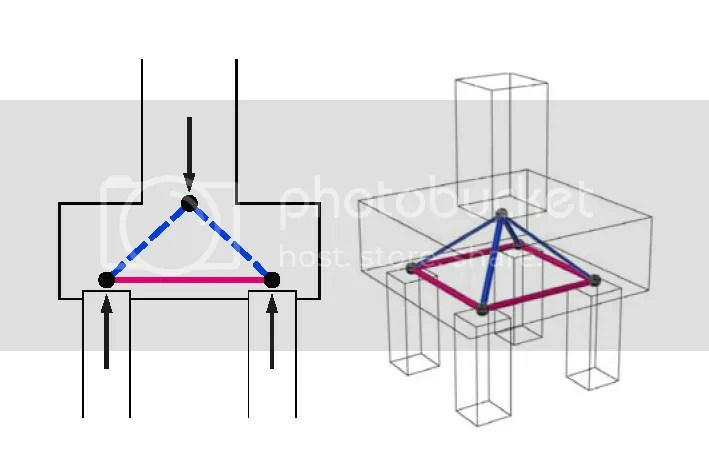 Like Maxwell method for analyzing trusses, STM is also a graphical procedure. It is based on graphics of structures, either two-dimensional or three-dimensional. 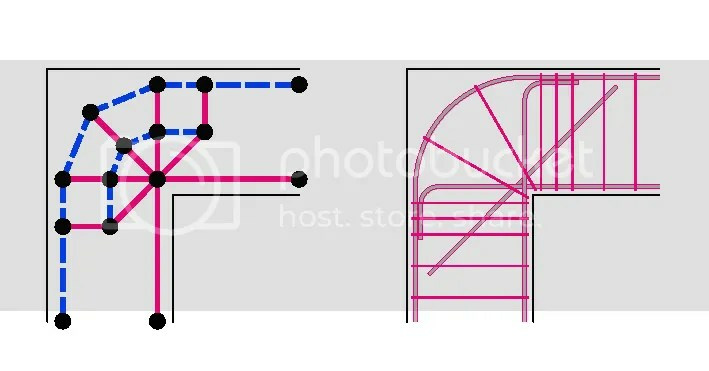 The angles, dimensions, and areas of struts and ties could be obtained by graphical methods. STM was presented by Schlaich et al. in the year 1987. Other research works include Collins and Mitchell (1991) and MacGregor (1992). It has been adopted by many codes or standards, such as AASHTO LRFD Specifications, ACI 318, CSA Standard, FIP Recommendations, and European Code. The common beam-column joints in moment frame structures are examples of D regions. They could be analyzed by STM models. Nothing is elixir. STM is only a tool kit for structural engineers. It is not a cookbook procedure. It could perform well only when used correctly. In order to use STM properly, engineers should have a good understanding of structural behavior and an accurate judgment of design issues. One characteristic of a proper STM model is that the load path is simple and direct. There are several possible load paths in reinforced concrete structures since there are several possible reinforcement arrangements. Nevertheless, we should be meticulous when choosing the load path. Load path should be as elegant as possible. Models which have unnecessarily complicated load paths are not good choices. The basic method for STM is showed in this flow chart (C. C. Fu, 2001). In STM truss models, nodes are the connections of members. Usually, there are three members converging into one node. 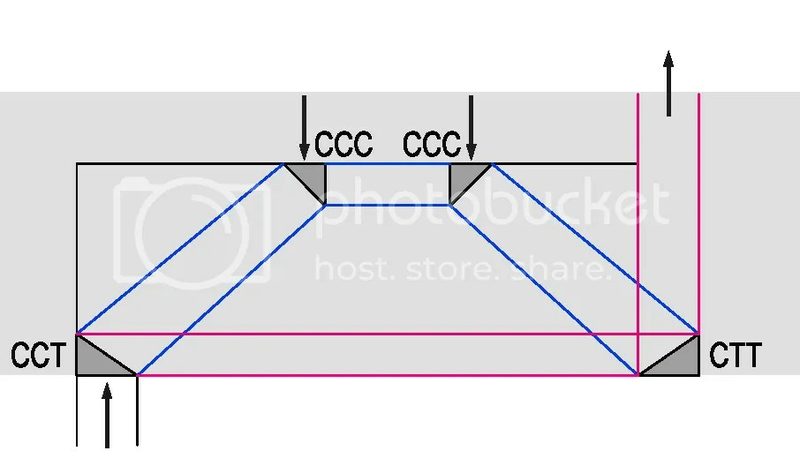 Based on the internal force of members (Compression or Tension), common nodes could be classified as CCC, CCT, and CTT. They have different calculation factors when checking node strengths. Since there are several possible models, we should use the most ideal model in our analysis. Generally, the common criterion is the amount of reinforcement. A model with the minimum amount of reinforcement is usually the optimal model. 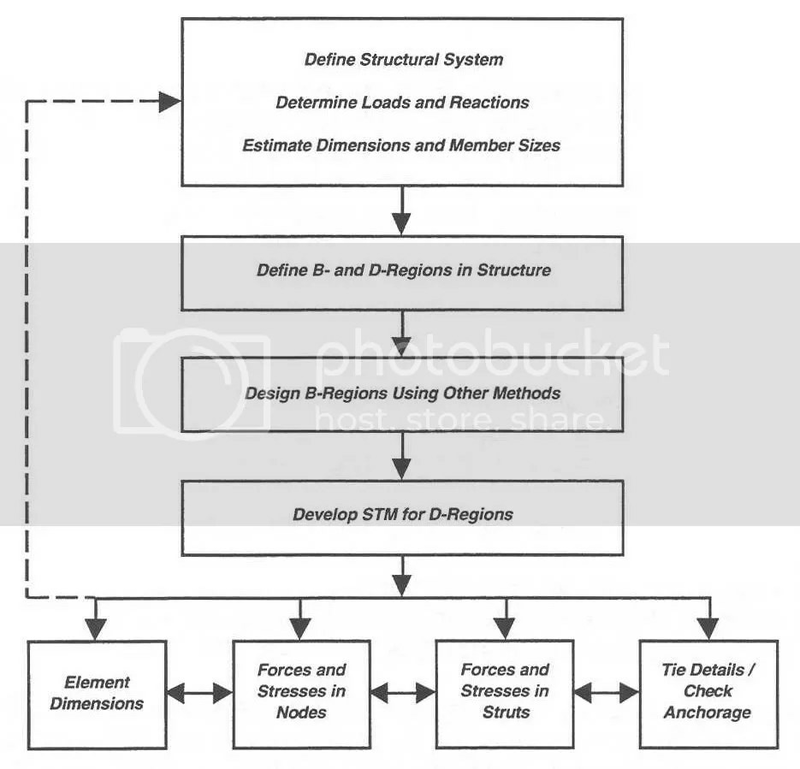 STM could provide relatively easy and accurate analysis for D regions in reinforced concrete. It is also useful in the shear design of structural members. Thus, it has a great potential in the field of concrete structures. Although STM is a graphical procedure, quantitative method is still required. The calculation of the amount of ties and the checking of nodes and struts all need quantitative procedures. We can see the detailed procedure in the following example. Detailed reinforcement could be arranged by following the location and distribution of idealized ties in the STM models. Pay attention to the anchorage. Otherwise, brittle anchorage failures might happen. Basically, there are three types of struts: prism, fan, and bottle. They have different factors in the calculation of compression strengths. Ties are tension members in the STM models. They should have adequate anchorage in the nodes. The tile of the paper of Schlaich et al. in the year 1987 is Toward a Consistent Design of Structural Concrete. Since STM considers all load effects simultaneously, it is a unified approach for concrete structures. One of the usages of STM is the shear design of concrete components. The vertical reinforcement (stirrups) in beams could be decided by STM analysis. Like deep beams, load bearing walls could also be analyzed by STM. Sometimes, STM models of concrete structures could be regarded as the x-ray pictures of the structure members, such as this STM model of a pier cap. In order to guarantee the safety of structural members, reinforcement should yield before the brittle crush of concrete. Schlaich, J.; Schäfer, K.; and Jennewein, M., “Toward a Consistent Design of structural Concrete”, PCI Journal, V. 32, No. 3, 1987, pp. 74-150. Good overview of STM. I’ve seen it a bit but never used it all that much. However, from what it seems like you hit all the high points. And I agree, back when I was learning in my concrete design course about a year the one thing that would always mess me up is coming up with an accurate model that didn’t leave out the design requirement for a stirrup in a critical area or something like that. The other thing that I like about it is that the calculation of forces for a large shape can be done using a truss model in a simple modeling software and it saves you a lot of time as compared to other methods. 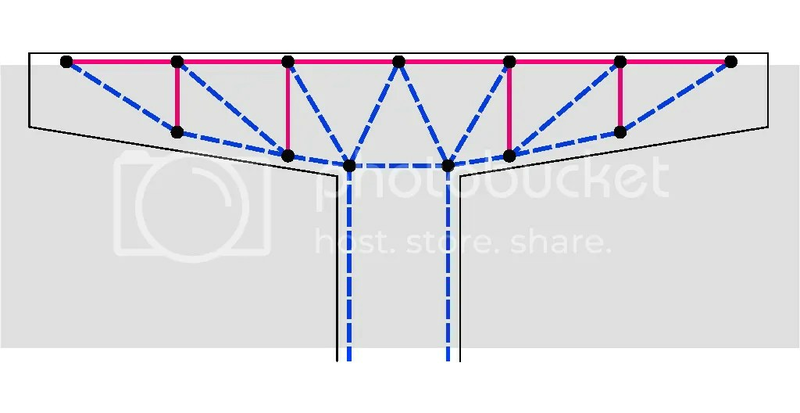 These truss model seem to have instability problem. how do you get around them? Engineers: stereotyped robots or innovative creators?